Red Bull Racing took the wraps off of its new 2009 F1 car, the RB5, at Jerez on Monday. We wonder if they'll try to add additional power to it with the little energy drink. 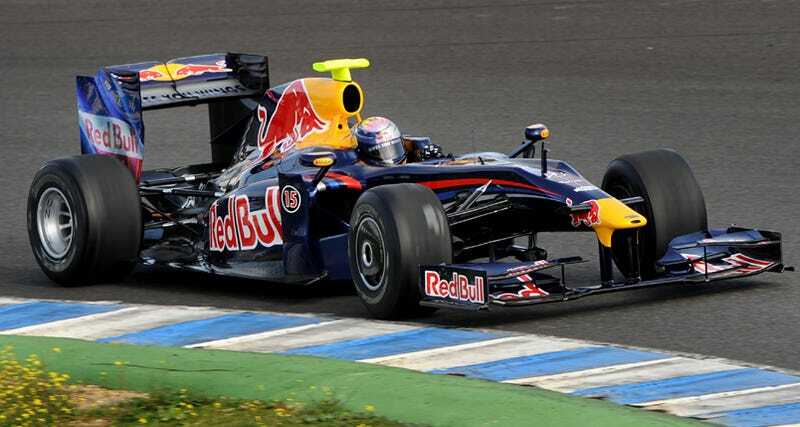 Red Bull Racing took advantage of the 2009 F1 rule changes and created the all new Renault-powered 2009 RB5. They've incorporated the new wing and aerodynamic changes as well as the new KERS (Kinetic Energy Recovery System) regenerative energy system, which allows for a slight boost during the race. "2009 arguably sees the biggest rule change for around twenty years. We have taken a clean sheet, blue sky approach, looking at the implications of these rules and how to interpret them, while not changing things simply for the sake of change. Apart from the gearbox internals, there is hardly any carry over from RB4." Red Bull Racing's 2009 car, the RB5, made its track debut this morning at the Jerez de la Frontera circuit in southern Spain. If they start giving out championship points for beauty, then the season seems to have got off to a good start as the RB5 is definitely a pretty little beast. This morning, Sebastian Vettel nosed the new car out of the garage into the pit lane and suddenly the countdown to Melbourne seems to have picked up speed. "It's good that we got the car running without any major problems, but it's much too early to say anything about performance," commented Seb after completing a handful laps before lunch. "Now we are concentrating on checking all the systems, which are very different to those on last year's car. It's good to be back in a racing car again and I feel as though we are on the way to Australia now. It was a strange feeling when I looked in my mirrors, as you don't see anything behind you, no wings or other bits: all you see is the rear tyres and it looks very naked. The view from the front is different too, because of the shape of the nose, but I'll get used to it very quickly". On hand to watch RB5's maiden outing were Chief Technical Officer, Adrian Newey and Team Principal, Christian Horner. "Today's run here in Jerez is the culmination of months of work for all the Red Bull Technology and Red Bull Racing staff, back at base in Milton Keynes," said Horner. "And like any new car launch it's a moment of excitement and speculation. This year will see us benefit from greater stability in terms of how we run the operation, with all our key players in the technical group having been with us for at least two years and we should not forget they designed a car that won a Grand Prix in 2008, in the hands of Sebastian Vettel. There is no reason to believe we cannot do that again with these new rules. We're excited about our driving pairing: Mark's making a great recovery from his broken leg in a very short space of time and the injury has had minimal impact on his preparation for the season. In Sebastian we've got one of the sport's most exciting young talents and he will be looking to build on his very impressive rookie season." "2009 arguably sees the biggest rule change for around twenty years," said Newey. "We have taken a clean sheet, blue sky approach, looking at the implications of these rules and how to interpret them, while not changing things simply for the sake of change. Apart from the gearbox internals, there is hardly any carry over from RB4." Testing continues for the rest of today, Vettel will drive tomorrow then, on Wednesday, it will be Mark Webber's turn to get his hands on RB5. "I thought I'd let Seb do the boring installation laps and the running-in," joked the Australian. "Wednesday's run will be as much a test for me as for the car, as it will be my first go in an F1 car since I broke my leg. My fitness programme is bang-on course for Melbourne and this test is a stepping stone on the way to being fighting-fit for my home race. The car looks fantastic and I'm looking forward to driving it."